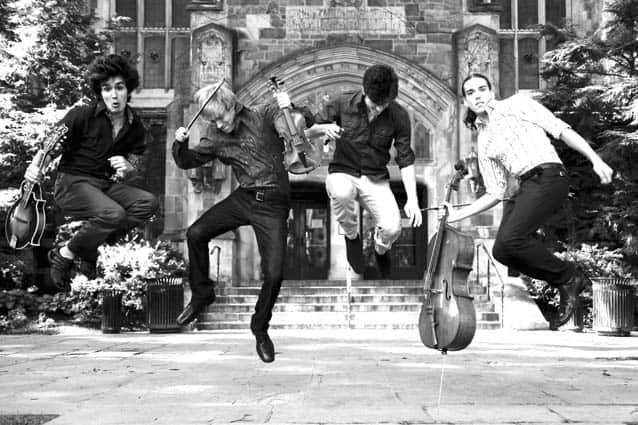 Thursday, March 30, 7 p.m.—CASTLETON—With the drive of Celtic fiddling, spontaneity of jazz, soul of the blues and intricacies of chamber music, the Jeremy Kittel Band captivates and energizes audiences. Don’t miss an upcoming performance in the Casella Theater at Castleton University on Thursday, March 30, 7 p.m. Doors open at 6:30 p.m.
Jeremy Kittel is an American fiddler, violinist, and composer. Fluent in multiple musical genres, his original music draws from traditional roots, jazz, Celtic, classical, electronic, and more. In addition to his own projects, he has composed and arranged for such artists as Abigail Washburn, Aoife O’Donovan, My Morning Jacket, Camera Obscura, Jars of Clay, Yo Yo Ma and the Silk Road Ensemble, Laura Veirs, and the Grammy-winning Turtle Island Quartet (of which he was a member for five years). “Without exaggeration, Jeremy Kittel is one of the great violinists and creative musicians of his generation. His technical virtuosity and sonic sensitivity are extraordinary, and his work both as a composer and performer are inspired. Jeremy is the kind of musician that you want to work with every day—his stylistic versatility, creative openness, and genuine musicianship are very special,” said Teddy Abrams of Louisville Orchestra. Tickets for this event are $18 for adults and $15 for seniors and alumni, and $12 for students and children. All faculty, staff, and students with a current Castleton University ID are eligible for free admission. Tickets can be purchased online at castleton.edu/tickets or at the Castleton University box office Monday-Friday, 10 a.m.-4:30 p.m.; or one hour prior to the performance. For more information, call 802-468-1119.